The below article was written prior to the recent volatility in the sector thanks to a deal that will likely see an uptick in production levels in the coming years, however the calls are still relevent today. Today we are going to look at a few Australian stocks who benefit from the boom in battery production following the launch of a specific hedge fund in the US targeting that thematic. Companies with lithium, cobalt, nickel and copper will be on the menu of the estimated $US250m Electric Metals Fund. Thanks to Tesla, it’s clear that the electric car revolution is no longer a pipe dream. We have recently seen Toyota pay for a large holding in Orocobre (ORE) as they strive to secure inputs for electric car batteries, a trend which should have much further to run over time. While the battery sector has clearly been “hot” for a while, today we will look for opportunities that may still remain from a solid risk / reward perspective into any future volatility. Global lithium demand is currently forecast to rise from 170,000 tonnes in 2015 to ~550,000 tonnes in 2025, with lithium-ion batteries accounting for around 70% of the demand uplift. There are now a number of lithium producers / explorers to choose from on the ASX which during the lithium price boom during 2016 often doubled / tripled in some cases. Today we have covered 5 of the growing list. MM has discussed ORE recently and we will be watching its price action closely when it recommences trading following its capital raising today. The A$361m raise, including A$282m from Toyota was done at a premium to the market but that's probably because the deal included exclusive marketing rights for the second stage of production. All in all, we think the deal is a good one however reasonable corrections in ORE are not uncommon. GXY has become a heavyweight in quick time, growing via a combination of developing its large Mt Cattlin mine in WA and through acquisitions of projects in Canada and Argentina. GXY is undoubtedly a volatile stock which looks good risk / reward buying ~$3.50, a correction of over 20% which seems a lot, but is well within the realm of possibility. We are looking to buy GXY around $3.50 as an aggressive play. Pilbara Minerals is widely acknowledged to be sitting on one of the world’s largest new lithium ore deposits only ~120 kilometres from Port Hedland in the Pilbara region of northern WA. It’s expected to be low cost with a long mine life (30+ years) on 2mtpa footprint. The mine is currently under construction and once fully ramped up by 2020 should produce 10% of the worlds lithium. We are looking to buy PLS around 88c as an aggressive play. MIN has a joint venture with Neometals and Chinese Lithium producer Jiangxi Ganfeng Lithium. The resource estimate is now over 60 million tonnes, way above the previously thought 23 million tonnes. Also worth noting that MIN provides Iron Ore exposure as well so is not a direct play on Lithium. We are looking to buy MIN under $17, a moderate risk play in the lithium space. KDR owns the significant Earl Grey Lithium deposit. We are looking to buy KDR around $1.75 as an aggressive play. The lithium-ion battery actually contains more cobalt than it does lithium meaning that the boom in batteries is huge for cobalt with close to 50% of the metal used in this manner. 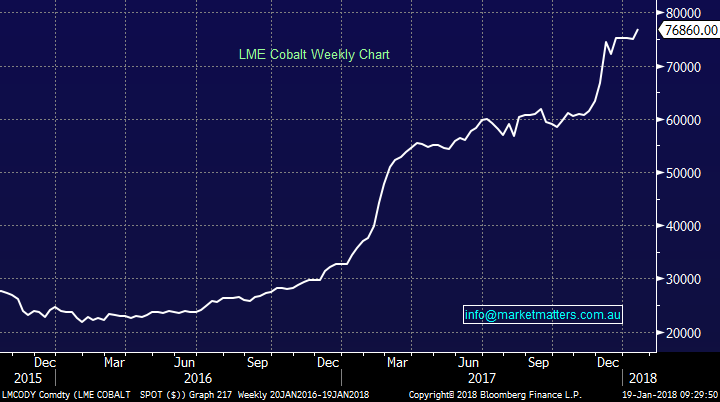 The cobalt price has had an amazing rally over the last 2-years but a pullback for a buying opportunity now feels a high probability. There are a number of junior miners looking to benefit from this boom in cobalt but they are very speculative, often with market caps well under $50m. CLQ owns nickel, cobalt and scandium projects in NSW, which they claim is one of the best nickel / cobalt deposits outside of Africa, with current reserves that should sustain almost 40-years of operation. CLQ has a market cap of $865m but has obviously had a stellar run since early 2016, similar to most resource stocks but we feel offers more “real” value than other stocks in the sector. We are looking to buy CLQ under $1.20 as an aggressive play. 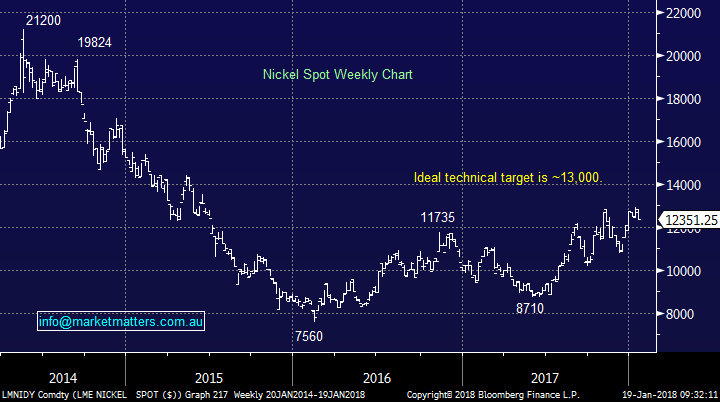 Nickel clearly has not enjoyed the exponential rally of cobalt but it’s still up ~30% from this time last year. The two nickel stocks which generally garner the most attention are Western Areas (WSA) and Independence Group (IGO). At MM we’ve enjoyed 2 nice profits in IGO over recent years and it remains a sector we like at the correct levels. We like WSA into weakness and it’s definitely a stock that is not unaccustomed to volatility. We are looking to buy WSA under $3. We like IGO under $4.50 and ideally closer to $4. We had 2 pullbacks in 2017 of ~20% so these targets are not unrealistic. We are looking to buy IGO under $4.50. Lithium – ORE, GXY, PLS, MIN and KDR. Nickel – WSA and IGO. Good to see an article focus on quality stocks in the sector rather than a lot of the spivvy stuff. Having said that, in the nickel and cobalt space, as a very early investor in CLQ, I suggest taking a look at Jervois (I moved all my CLQ monies there). DYOR ofc.